Every year, an entire week of TV programming is devoted to the ocean’s scariest predator. Maybe the world’s fascination began when Steven Spielberg introduced us to his 25-foot animatronic shark. You know, Jaws. “Just when you thought it was safe to go back in the water … ” is the 1975 film’s tagline. And it applies so well to the gold market right now. Gold traders are fleeing because prices keep falling. But something tells me it is safe to go back in the water. Bullishness is very low. 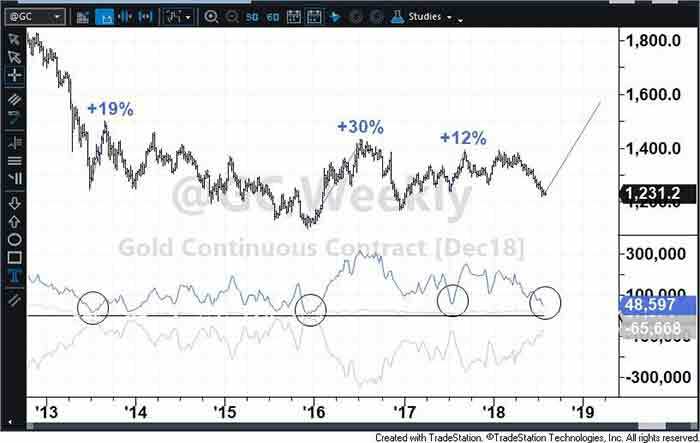 The blue line across the bottom section of the chart shows traders haven’t been this afraid of betting on gold in over two and a half years. The price jumped 19% in 10 weeks during the summer of 2013. It jumped 30% in six months following the Federal Reserve’s much-feared rate hike in December 2015. Gold jumped 12% after bulls vanished this time last year. Much like then, now isn’t the time to run for the dunes. The lifeguard is bringing out the green flag, the all-clear for you to get back in. Of course, you could use this chance to bet on the yellow metal itself. Anthony Planas recently talked about a great way to invest in an exchange-traded fund (ETF) that’s redeemable for physical gold. If you’re a more active trader and want to magnify your returns, consider gold mining companies. Many of them outperformed the price of gold during its downturns. And when gold is rising, they typically move higher a lot faster. You can tap into the top mining companies with the VanEck Vectors Gold Miners ETF (NYSE: GDX) or the VanEck Vectors Junior Gold Miners ETF (NYSE: GDXJ). In the first half of 2016, when the price of gold jumped by 30%, GDX and GDXJ surged by 108% and 149%, respectively. Might as well at least dip your toes in!